John Ockelford Thompson was born in Springfield, the son of the editor of the Essex (County) Chronicle, a post he was to undertake from his father's death to his own. He married in 1895 and went on to have five sons, one of whom was killed in the First World War. He was first elected to Chelmsford Borough Council in 1907, raised to an Alderman the same month, and went on to serve as mayor on seven occaisons, the first in 1916. He numerous public appointments over the course of his life. He was killed in October 1940 along with his wife, a son, two grandchildren and a servant when his New London Road home was struck and destroyed by a German bomb. During the early months of the Second World Ward John was a prominent figure behind Chelmsford's Flight of Fighters Fund (a fundraising effort to buy Spitfire aircraft) and the local Air Raid Damage Funds Association. He was entitled to the C.B.E. in 1938 for his valued public services, having been received the O.B.E. for similar services in the First World War. John was killed on Sunday 13th October 1940 when Chelmsford suffered its most serious bombing incident of the war to date when a lone Luftwaffe aircraft dropped two bombs over the town. 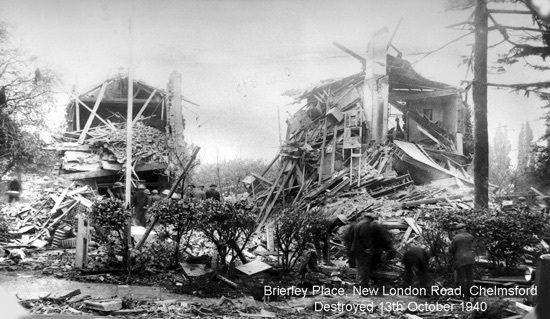 At 7.30 p.m. one of these, a high explosive, scored a direct hit on his home, Brierley Place (number 52), New London Road, the home to the mayor and his family. The bomb is believed to have passed through the building and exploded in its basement, ‘collapsing it like a pack of cards’. Debris was strewn across New London Road and caused its closure between Queen Street and Southborough Road. The mayor, his family and servants were at home and were thought to have been sheltering in the basement when the bomb struck. The rescue services were soon at work on the scene and by 10.40 p.m. New London Road had been cleared. However, it was not until 1.01 a.m. that the first casualty figures were received at the Police H.Q. - “Ten people involved (actually nine), two children recovered dead, three householders rescued but one injured, mayor and mayoress still unaccounted for”. The dead children were the Mayor’s grandchildren, 8 year-old Audrey Mary Thompson and her 14 month-old sister Diana Louisa Thompson. Their mother, Muriel who suffered serious injuries, was one of those rescued, along with a nurse and another daughter-in-law of the Mayor. By 5.31 a.m. a further two bodies were recovered, and by 11.50 a.m. another, the fifth fatality, was found. Rescue workers continued their search into Tuesday and in mid afternoon the remains of sixth body, a servant, were found. The four adults killed were subsequently identified as the Mayor, 68 year-old John Ockelford Thompson C.B.E. D.L. 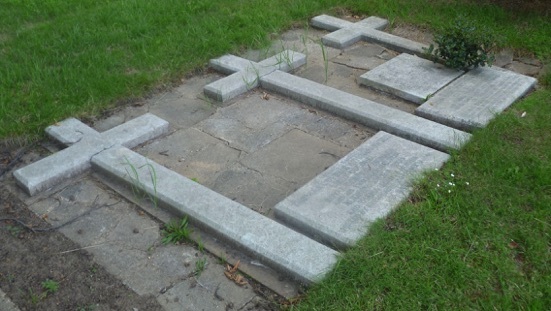 J.P., his 78 year-old wife Emma, their 41 year-old son Lt-Col. Thomas Coverley Thompson and Alice Maud Emery, also 41, who was a servant for the mayor. The funeral service of John and his family was held at Chelmsford Cathedral on 16th October 1940. Their five coffins were placed in the building overnight prior to the service. Their deaths had come as a great shock to the town and the Cathedral was filled to overflowing for the service which was conducted by the Bishop of Chelmsford and the Provost, the Very Rev. William Morrow. The congregation was swelled by a considerable number dignitaries from all over Essex and beyond. After the service the coffins were driven to the Borough Cemetery for burial, passing the remains of Brierley Place on the way. Large crowds lined the route. John was buried in grave number 6183. His wife, son and grand daughters were buried close by. John is commemorated by the King Edward VI Grammar School's war memorial. John left an estate valued at £9,993 1s. 7d. John (picture copyright Chelmsford Museum) was born in Springfield on 8th October 1872, the only son of the newspaper proprietor Thomas Thompson and Sarah Elizabeth Thompson (nee Ockelford). His father had been born in Rochdale, Lancashire around 1846; his mother in Grantham, Lincolnshire in 1849. The couple had been in Chelmsford since at least 1871, having married in Lincolnshire in 1868. John gained a sister Mary Brierley Thompson, born in 1878. In 1881 the census recorded John, aged eight, living with his parents, sister and a servant at 7 Chelmer Terrace in Springfield. His father was editor of the Essex County Chronicle. After an education at King Edward VI Grammar School in Chelmsford from 1883 to 1888 John followed his father's career as a journalist. The census of 1891 listed 18 year-old John living with his parents and sister at Granville Terrace, Mildmay Road in Chelmsford. He was described as a reporter, his father as a newspaper owner and editor. James Ockelford Thompson and his twin Reginald John Tanner Thompson (born 28th July 1896, christened at Holy Trinity Church in Springfield on 2nd August 1892), Thomas Coverley Thompson (born on 25th May 1899 and christened at Holy Trinity Church in Springfield on 25th July 1899), William Brierley Thompson (born on 6th February 1901) and Robert Thompson (born on 19th August 1904). The 1901 census listed John, aged 28, living with his wife and four sons and two servants at 3 Meadowside in Springfield. He was described as a newspaper proprietor. Following his father’s death in 1908 until his own, John was editor and part proprietor of the Essex Chronicle. In April 1911 the census recorded John, his wife, five sons and two servants at The Eaves in Springfield Road, Springfield. John's son, Cyril James Ockelford Thompson, died of wounds on Christmas Day 1917, in what is now Israel, while serving as Lieutenant in the 18th Battalion of the London Regiment (London Irish Rifles). He was aged 21. John's sister died in 1920. John became one of the most respected men in Essex. He was first elected to Chelmsford Council in November 1907 as one of the members for the new Springfield Ward. In same month he was raised to Alderman and served on the Council for the remainder of his life. In 1911 he organised Chelmsford’s coronation celebrations. In November 1916 he was elected Mayor for the first time. Subsequently he held the office in 1920-21, 1921-22, 1928-29, 1929-30, 1936-37, and 1939-40. On the occasion of his 68th birthday, the week before his death, he had accepted the Council’s invitation to serve again in the forthcoming municipal year (1940-41). Much of his best work for the Council was as Chairman of the Council’s Education Committee, a position he held from December 1921. He was also Chairman of the Public Health Committee and been a County Councillor for the Chelmsford South Division for six years. During the First World War he served with the Essex Volunteer Regiment initially as a private and later as an officer. He then went onto special coastal service with the Dorsetshire Regiment. 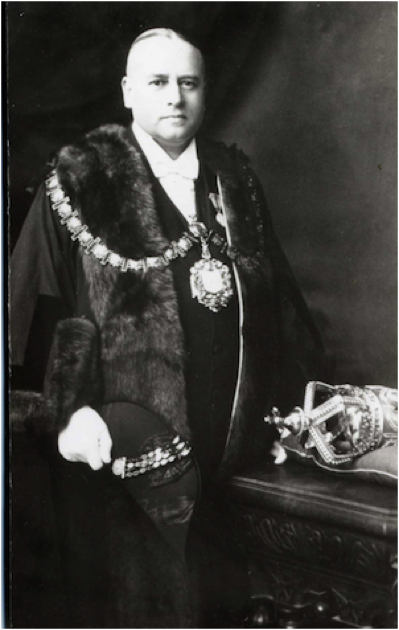 After the war he was largely responsible for Chelmsford’s War Memorial Fund, and during his mayoralty in 1920-21 and 1921-22 he took a great interest in the unemployed, for whom he started and carried on a fund. He had held numerous other public appointments including; an Essex J.P. since February 1916, Chairman of the Chelmsford Bench of Justices, a Deputy Lieutenant of Essex, Chairman of the Chelmsford Brotherhood, President of the Essex & Suffolk Brotherhood Federation, Chairman of the Chelmsford District War Pensions Committee, Chairman of the Ministry of Labour Employment Committee, a member of the Essex Standing Joint Committee, a member of the Essex Federal Council of the League of Nations Union, Chairman of the Essex Discharged Prisoners’ Aid Society, a member of the Essex Territorial Army Association, a member of His Majesty’s Prison Board of Visitors, Chairman of the West Essex Building Society, Honorary Secretary to the Essex Association of the Treatment of Consumption, a Commissioner of Income Tax, Chairman of the Chelmsford Mutual Fund Association, and an appointed member Essex Agricultural Wages Committee. He was also a Freemason (Easterford Lodge), and a founder-member of the Old Chelmsfordian Lodge.